Sunkanmi Omobolanle biography,his wife,Father,Mother and Fathia Scandal. Actor Sunkanmi Omobolanle is the son of Sunday Omobolanle Baba Aluwe and stepson of Peju Ogunmola another veteran actor in the Yoruba movies genre. Sunkanmi Omobolanle biography.Sunkanmi attended the Nigerian Military School before he proceeded to Olabisi Onabanjo University where he obtained a bachelor's degree in business administration.He was born on the 1st of March in Oyo state Nigeria.His parents are Sunday Omobolanle and Peju Ogunmola.His real mother Kudirat Folashade died many years ago. 2011 whan it was rumoured that he was having an affair with veteran actress Fathia Balogun.The gist was that the two were at a film location and when everybody else had gone to sleep at night,the two got together and were alerted by the sounds Fathia was making while she was in an intimate session with Sunkanmi.The whole thing sounds so ridiculous to me,i personally don't believe this,but hey,when it comes to money and s.ex,you can't vouch for nobody.The gist further said the two continued their relationship when they met in Dubai. Scandals apart,the actors career is going great and blossoming.Sunkanmi has revealed that his much anticipated movie, The Knot will be released to all cinemas across Nigeria in the coming months. The Oyo state-born actor in an interview with NET, also disclosed that the upcoming movie, which is currently at the post-production stage, has gulped over N6million. ‘We are starting a private screening tour in June. We will have it in Lagos, Ibadan, Abuja, and Port Harcourt, after which it would be released to all cinemas across the country,’ he said. The forthcoming movie, which was shot on location in Lagos by seasoned cinematographer, Akin Alabi, parades stars like Saidi Balogun, Bimbo Akintola, Gabriel Afolayan, Hafiz Oyetoro aka Saka, Ayo Adesanya, Niyi Johnson among others. The Knot tells the story of inseparable childhood friends, whom fate subsequently pitched at opposite ends against each other at adulthood. The actor is happily married to his wife Abimbola.They got married On June 30, 2011. 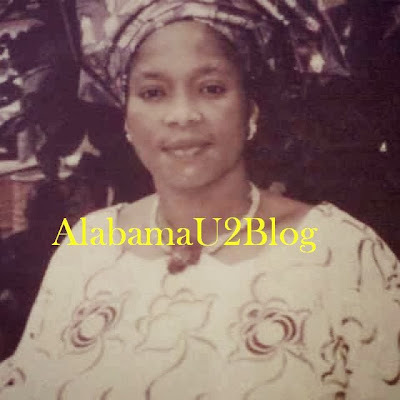 The late mother of Sunkami,Kudirat Folashade Omobolanle.